The new Happy Diamonds line lifts Chopard's iconic moving diamonds heavenwards on a reverie-inspired journey full of light and joyful promise. 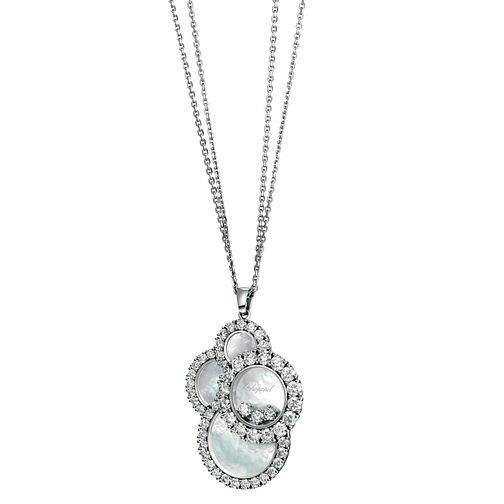 This elegant pendant features four 18-carat white gold circles of varying sizes, prong-set with diamonds, which appear irregularly superimposed to resemble a cloud suspended delicately in the sky. Each is backed with a disc of mother-of-pearl, the foremost creating a dazzling frame for four prong-set diamonds that pirouette with unfettered imagination against their iridescent backdrop. The pendant hangs from a polished double chain by a polished clasp.